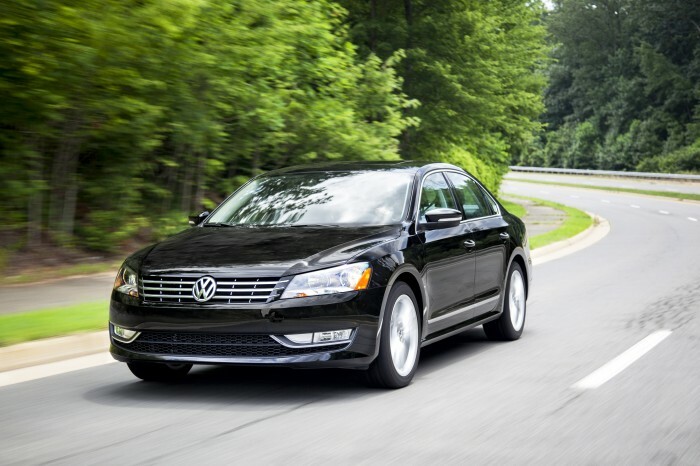 For the 2014 model year, the Passat will see better fuel economy than ever before with a new 1.8-liter, turbocharged four-cylinder engine replacing the 2.5-liter five-cylinder in the SEL model. The German carmaker’s new Car-Net telematics system will also debut this year adding more technology to the car while a rearview camera is now standard on most trims. As the only European car in the family sedan segment, the 2014 Passat stands out with its clean styling showing its foreign roots. A rounded nose make the silhouette purely Volkswagen, while distinct body lines actually add a bit of flair normally only seen in American-made cars, making it more appealing to the U.S. market. Four seems to be the lucky number of the 2014 Passat with four different engine offered to fulfill anyone’s needs. A 2.5-liter five-cylinder engine churns out 170 horsepower for the S, SE and Wolfsburg models, while the all-new 1.8-liter turbocharged four-cylinder engine with 170 hp will come standard on the SEL model. A turbocharged 2.0-liter four-cylinder diesel (TDI) will get the most miles per gallon while also getting a pretty good 140 hp. Finally, the strongest engine of the bunch is the 3.6-liter V6 which boasts a lovely 280 horsepower and is optional on the SE and SEL models. Each engine gets slightly different mpg with the 3.6-liter V6 getting the lowest at 23 mpg combined, the 2.5-liter boasting 26 mpg combined, and the 1.8-liter turbocharged engine boasting 28 mpg combined. The 2.0-liter TDI boasts the highest with an EPA-estimated 35 mpg combined. Room is plentiful when it comes to the 2014 Passat’s cabin with enough room for grown adults to stretch their legs in both the front seat and back. Typical to VW’s vehicles, the interior materials are top quality and considered some of the best in its class. The design as a whole is upscale with a simple layout of gauges and controls to keep things from getting too complicated. The 2014 Passat is perfect when it comes to safety, receiving five out of five starts in the government’s overall crash testing. The Insurance Institute for Highway Safety also found the Passat to be top-notch, awarding the sedan with its highest possible score of “Good” for frontal moderate-overlap, side-impact, and roof-strength tests.